The Lycoming Company claims to have been founded in 1845 by Madame Ellen Curtis Demorest; however, the early history of the company prior to 1860 is unclear. The Demorest family published fashion magazines and manufactured sewing machines during the early period. Around 1883, two men with the last name of Scofield purchased the company and built a factory in Williamsport, Pennsylvania, in Lycoming County. The factory produced sewing machines, bicycles, typewriters, and opera chairs. By 1907, the manufacture of sewing machines became unprofitable and the company was sold and restructured as the Lycoming Foundry and Machine Company, shifting its focus toward automobile engine manufacturing. In 1929, they produced their first aviation engine, the R-680. This became a fairly successful design and was used widely in light aircraft. The aircraft applications included: Beech AT-10 Wichita, Boeing/Stearman PT-13, Cessna AT-8, and AT-17, Stinson Reliant and Vigilant, as well as the Waco (Weaver Aircraft Co.) S series. 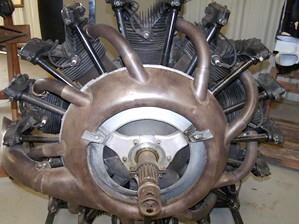 The R-680 is a 225 hp nine-cylinder air-cooled radial engine. The particular variant that is here in the museum is a B4E that was produced for trainer aircraft with a front exhaust collector ring. Manufactured by: Lycoming Foundry and Machine Co.